XOXO Jes - Canadian Entertainment News: Blue Ivy...set for life? 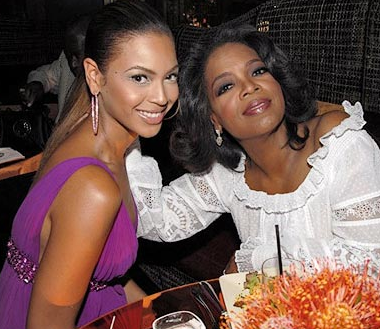 Some reports are saying that Oprah has been named the Godmother of Jay Z and Beyonce's bb. Can you say 'set for life'...cause that baby can if her parents bite the dust before she is 18. This is not confirmed and probably isn't true...if it is I bet Solange Knowels, who constantly gets forgotten because she is uber-forgettable, is probably pissed that she didn't get the coveted title. At least that would put her in the news for a day...that would be longer than any other time in the last 3 years. Anyways...I really wanted to write this because I wanted to know if, even thought I am over 18...can I make Oprah my Godmother, emancipate myself from my parents and have her(money) take care of me? Cause that would be rad.